Nadezhda. Image credit: Sven Grahn. The Nadezhdas are Soviet maritime navigation satellites, adapted from the Tsikada series, that can pinpoint distress signals from ships and aircraft. 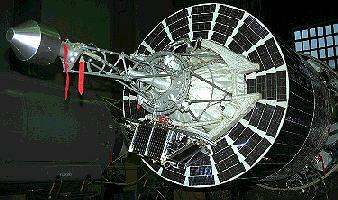 The original Nadezhda ("hope") satellites, launches of which began in 1982, carried the COSPAS/SARSat international space search and rescue system. From 1995, the Nadezhda-M series was introduced with the Kurs system for better location of air, sea, and ground craft in distress and for transmission of digital data to the Kurs Center. Nadezhda-M6 was launched on June 28, 2001; Nadezhda-M7 on September 26, 2002.